Today I had the opportunity to testify before the Senate Budget Committee about CBO’s most recent analysis of the long-term budget outlook. Under current law, the federal budget is on an unsustainable path, because federal debt will continue to grow much faster than the economy over the long run. Although great uncertainty surrounds long-term fiscal projections, rising costs for health care and the aging of the population will cause federal spending to increase rapidly under any plausible scenario for current law. Unless revenues increase just as rapidly, the rise in spending will produce growing budget deficits. Large budget deficits would reduce national saving, leading to more borrowing from abroad and less domestic investment, which in turn would depress economic growth in the United States. Over time, accumulating debt would cause substantial harm to the economy. The following chart shows our projection of federal debt relative to GDP under the two scenarios we modeled. 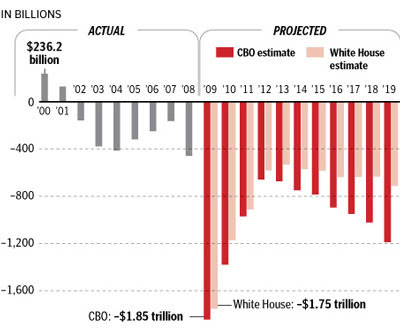 President Disaster will quadruple the US budget deficit his first year in office.